The month of April is known as the National Heartworm Awareness Month. It is a month dedicated to spread awareness about a life-threatening disease called heartworm. Many pets across the globe are fast getting infected by this horrendous disease and thus, it is essential to spread the word so that pet parents can know about this deadly disease. Heartworm – What It Is? As you have just read, heartworm is a serious health condition that is fast spreading to all parts of the world. This type of disease mainly affects canines and felines and is caused by a parasite called ‘Dirofilaria immitis’. These foot-long creatures can live and breed in the lungs and the heart of your pets, causing immense discomforts. This can possibly lead to issues like lung disease, heart failure or various other organ failures. Since National Heartworm Awareness Month is just around the corner, it is essential to feed pet parents with some facts about this mosquito-transmitted disease. Heartworm affects a large chunk of animals. Unfortunately, they mostly affect dogs, cats and ferrets. Dogs provide the ideal atmosphere for heartworms to mature into adults and are the natural host for most heartworm transmissions. In cats, heartworm can live up to 2-3 years while in dogs that number increases upto 5-7 years. Heartworm can infect as many as 30 species of animals. Diagnosing heartworm disease in cats is a more arduous task than in dogs. As many as 70 different species of mosquitoes are capable of transmitting the dangerous heartworm disease. Heartworms cannot directly pass from one animal species to another. Matured or adult heartworms look like spaghetti. Both dogs and cats should be put on regular heartworm prevention. Heartworm disease causes a lasting damage to the heart, lungs and arteries in dogs. Now that you have a fair idea about this life-threatening mosquito-transmitted disease, it is not only important to spread the word, but also take precautionary steps to prevent heartworm from affecting your furry friend. Regular blood tests and vet check-ups is essential. Limit your buddy’s outdoor play time to prevent him from coming in contact with mosquitoes. Option for heartworm preventatives like Heartgard Plus to keep your pal well protected. 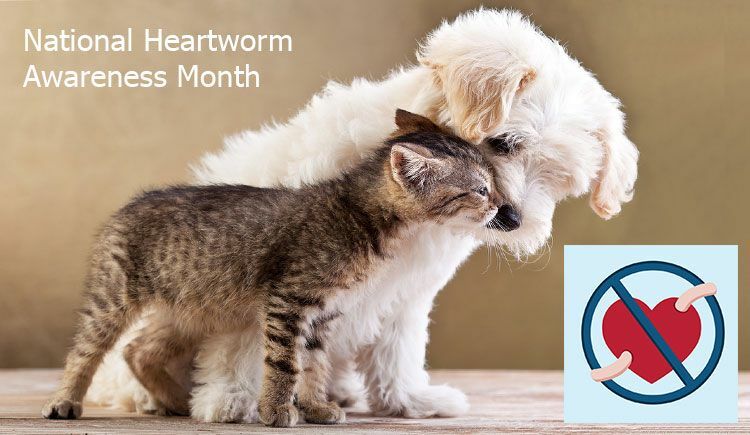 This National Heartworm Awareness Month pledge to spread the heartworm awareness and at the same time protect your pet furry pal from the same! Happy National Heartworm Awareness Month to you and your buddy!